Women made up 24 percent of protagonists in the 100 top domestic grossing films of 2017, according to one study. When director Steven Soderbergh rebooted the classic heist film "Ocean's 11," the ensemble cast sought to capture the spirit of the 1960s Sinatra-led Rat Pack while paying homage to the original film: same name (with "11" becoming "Eleven"), same setting (Las Vegas), same recognizable — and male — names to bring the story to life on screen. The 2001 "Ocean's Eleven" was a box office success, and now 11 years after the last film in the franchise, a new pack is picking up where the "Ocean's" trilogy left off: "Ocean's 8" will tell a similar heist-themed plot with a slew of recognizable names — but this time, it's the women who are front and center of the story. "We're celebrating eight distinct women from eight distinct backgrounds, and this is what the world looks like, not just what Hollywood has made the world look like," director Gary Ross told reporters in May at a press conference to promote the film in New York City. "Ocean's 8" follows Debbie Ocean (Sandra Bullock), who has been released from jail after 5 years and assembles a team of experts to rob the Met Gala in New York City. The concept, Ross said, came after he directed "The Hunger Games" and found himself wanting to explore more films starring powerful, female protagonists with complex upbringings. According to a study by The Center of Women in Television and Film at San Diego State University, females comprised 24 percent of protagonists in the 100 top domestic grossing films of 2017, which represents a 5 percent decline (down from 29 percent) in 2016. At the May press conference, "Ocean's 8" co-star Mindy Kaling said she felt like the film “passes the Bechdel test with flying colors,” referring to the Wallace-Bechdel test, which originated from cartoonist Alison Bechdel and examines if a work of fiction features two female characters who are speaking about something other than a man. “These women are orchestrating a crime as opposed to fighting over a man,” Kaling said. The Bechdel test is often referenced in Hollywood when talking about female representation on screen, and it's also inspired theaters in other countries as a grading tool in an effort to make audiences more mindful of what they’re watching. In 2013, four theaters in Sweden announced they would give a film an “A” rating on its movie poster if it passed the Bechdel test. We're celebrating eight distinct women from eight distinct backgrounds, and this is what the world looks like, not just what Hollywood has made the world look like. In 2013, according to IndieWire, only 30 percent of Swedish films passed the Bechdel test. The next year, it jumped to 60 percent; in 2015, 80 percent of films earned an "A." But using the Bechdel test as a measurement can also miss the point, according to Dr. Martha Lauzen, executive director of the Center for the Study of Women in Television and Film. “A far better test would consider the centrality of female characters to the narrative, the agency of female characters and the dimensionality of female characters,” Lauzen said. Beyond the conversation of including more women on the silver screen, the cast and crew of “Ocean’s 8” emphasized how important it was for them to include a diverse cast who come from a variety of backgrounds. 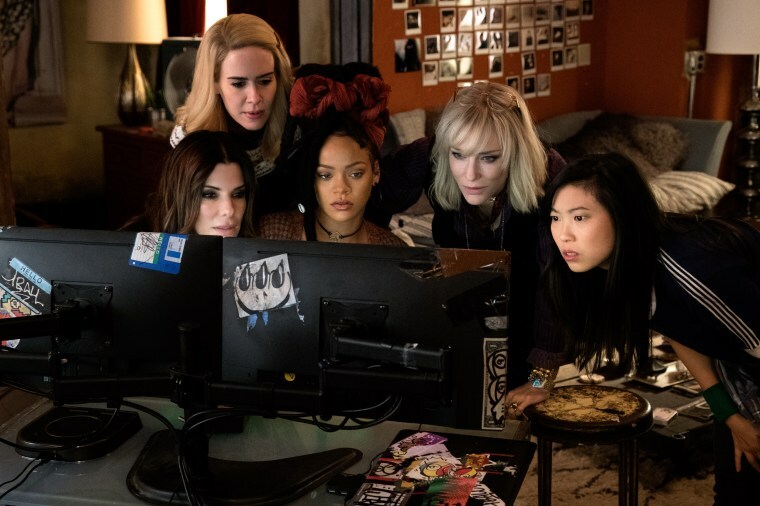 Olivia Minch, "Ocean's 8" co-screenwriter, told reporters at the May press conference that one way they sought to make the characters multidimensional, the film featured all five boroughs of New York City to show a diversity of backgrounds. “Any woman — or human being — knows that women are funny, smart, nuanced, and sometimes contradictory, and it’s crazy, but we have to start seeing characters like that,” Minch said. The same study by The Center of Women in Television and Film also shows that out of the top 100 films of 2017, 68 percent of all female characters were white, while 16 percent were Black, 7 percent were Asian, 7 percent were Latina, and 2 percent were identified as another race or ethnicity. Kaling, who said at the press conference that she learned to speak Hindi for some of her “Ocean’s 8” scenes, said she was happy to play the role of Amita, a jewelry maker. Diversity and inclusion should not be based upon the success of one movie. If these films don’t do whatever we think it’s supposed to do, it doesn’t mean more movies shouldn’t be made. Rapper and actress Awkwafina, who plays thief Constance in the film, told NBC News what she appreciates about "Ocean's 8" is that for the people of color in it, that’s not the only thing that defines them. “My character of Constance isn’t defined by her 'Asianess,'” Awkwafina said. “There’s many ways Asian Americans are misused in movies — they’re seen as the joke or stereotypes. But, people should let them speak in their American voices and give them unique, complex characters that aren’t a brooding 'tiger mom' or overachieving student." She added that films that are trying to create more opportunities for real representation shouldn't be defined by dollar numbers at the box office. But those opportunities for more nuanced characters are not immune to criticism — something Awkwafina said she's been keenly aware of. Has 'Ghostbusters' always been politicized? Similar backlash was also faced by the 2016 female-led reboot of "Ghostbusters," with some critics suggesting the casting was a "marketing gimmick." Star Leslie Jones was also subjected to a storm of racist and misogynist messages on Twitter, leading supporters to rally around her with the #LoveforLeslieJ hashtag. Regardless of whether a movie tells an original story or is a revival, Lauzen, the Center of Women in Television and Film executive director, said audiences generally just want to see entertaining stories that are told well. The Center of Women in Television and Film study shows that in films with at least one woman director or writer, females comprised 45 percent of protagonists, while in films with exclusively male directors and/or writers, females accounted for 20 percent of protagonists. It also showed that in films with at least one woman director or writer, females comprised 48 percent of major characters while in films with exclusively male directors or writers, females accounted for 33 percent of major characters. At this year’s Cannes Film Festival, Cate Blanchett (who also stars in "Ocean's 8" as Lou, Debbie Ocean's partner-in-crime) led the speech during a protest held by 82 female filmmakers representing the number of female directors who have been nominated in the festival’s 71-year history. During the "Ocean's 8" press conference, Blanchett said out of the 21 films that competed at this year’s Cannes for the Palme d’Or, the festival’s top prize, only three of those films were directed by women. And while "Ocean's 8" features a male director, Blanchett and co-star Anne Hathaway said it was also important to have more men willing to help create multi-dimensional roles for women. CORRECTION (June 1, 2018, 9:52 a.m. ET): An earlier version of this article misstated the year "Ocean's Eleven" was released. It was 2001, not 2011. CORRECTION (June 8, 2018, 11:30 a.m. ET): An earlier version of this article misstated the name of a cartoonist credited with originating a test to gauge female representation in a film. She is Alison Bechdel, not Alex.